Calvinism (also called the Reformed tradition, Reformed Christianity, Reformed Protestantism or the Reformed faith) is a major branch of Protestantism that follows the theological tradition and forms of Christian practice of John Calvin and other Reformation-era theologians. Calvinists broke with the Roman Catholic Church but differed from Lutherans on the real presence of Christ in the Eucharist, theories of worship, and the use of God's law for believers, among other things. The term Calvinism can be misleading, because the religious tradition it denotes is and has always been diverse, with a wide range of influences rather than a single founder. The movement was first called Calvinism by Lutherans who opposed it, and many within the tradition would prefer to use the word Reformed. 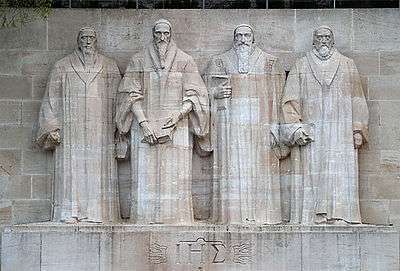 Early influential Reformed theologians include Ulrich Zwingli, John Calvin, Martin Bucer, William Farel, Heinrich Bullinger, Peter Martyr Vermigli, Theodore Beza, and John Knox. In the twentieth century Abraham Kuyper, Herman Bavinck, B. B. Warfield, Karl Barth, Martyn Lloyd-Jones, Cornelius Van Til, and Gordon Clark were influential, while contemporary Reformed theologians include J. I. Packer, R. C. Sproul, Timothy J. Keller, John Piper, and Michael Horton. Reformed churches may exercise several forms of ecclesiastical polity, but most are presbyterian or congregationalist with some being episcopalian. Calvinism is largely represented by Continental Reformed, Presbyterian, and Congregationalist traditions. The biggest Reformed association is the World Communion of Reformed Churches with more than 80 million members in 211 member denominations around the world. There are more conservative Reformed federations like the World Reformed Fellowship and the International Conference of Reformed Churches, as well as independent churches. Despite its negative connotation, this designation became increasingly popular in order to distinguish Calvinists from Lutherans and from newer Protestant branches that emerged later. 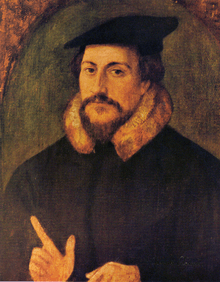 Even though the vast majority of churches that trace back their history to Calvin (including Presbyterians, Congregationalists, and a row of other Calvinist churches) do not use it themselves, since the designation "Reformed" is more generally accepted and preferred, especially in the English-speaking world. Moreover, these churches claim to be—in accordance with John Calvin's own words—"renewed accordingly with the true order of gospel". Since the Arminian controversy, the Reformed tradition—as a branch of Protestantism distinguished from Lutheranism—divided into two separate groups, Arminians and Calvinists. However, it is now rare to call Arminians a part of the Reformed tradition, as many see these two schools of thought as opposed, making the terms Calvinist and Reformed synonymous. While the Reformed theological tradition addresses all of the traditional topics of Christian theology, the word Calvinism is sometimes used to refer to particular Calvinist views on soteriology and predestination, which are summarized in part by the Five Points of Calvinism. Some have also argued that Calvinism as a whole stresses the sovereignty or rule of God in all things including salvation. Due to Calvin's missionary work in France, his programme of reform eventually reached the French-speaking provinces of the Netherlands. Calvinism was adopted in the Electorate of the Palatinate under Frederick III, which led to the formulation of the Heidelberg Catechism in 1563. This and the Belgic Confession were adopted as confessional standards in the first synod of the Dutch Reformed Church in 1571. Leading divines, either Calvinist or those sympathetic to Calvinism, settled in England (Martin Bucer, Peter Martyr, and Jan Łaski) and Scotland (John Knox). During the English Civil War, the Calvinistic Puritans produced the Westminster Confession, which became the confessional standard for Presbyterians in the English-speaking world. Having established itself in Europe, the movement continued to spread to other parts of the world including North America, South Africa, and Korea. Although much of Calvin's work was in Geneva, his publications spread his ideas of a correctly Reformed church to many parts of Europe. 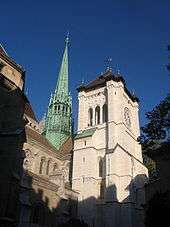 In Switzerland, some cantons are still Reformed and some are Catholic. Calvinism became the theological system of the majority in Scotland (see John Knox), the Netherlands (see William Ames, T. J. Frelinghuysen and Wilhelmus à Brakel) and parts of Germany (especially these adjacent to the Netherlands) in the Palatinate, Kassel and Lippe with the likes of Olevianus and his colleague Zacharias Ursinus. In Hungary and the then-independent Transylvania, Calvinism was a significant religion. In the 16th century, the Reformation gained many supporters in Eastern Hungary and Hungarian-populated regions in Transylvania. In these parts, the Reformed nobles protected the faith. 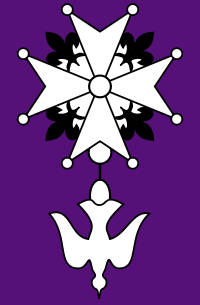 Almost all Transylvanian dukes were Reformed. Today there are about 3.5 million Hungarian Reformed people worldwide. It was influential in France, Lithuania and Poland before being mostly erased due to the counter-reformational activities taken up by the monarch in each country. Calvinism gained some popularity in Scandinavia, especially Sweden, but was rejected in favor of Lutheranism after the Synod of Uppsala in 1593. Most settlers in the American Mid-Atlantic and New England were Calvinists, including the English Puritans, the French Huguenots and Dutch settlers of New Amsterdam (New York), and the Scotch-Irish Presbyterians of the Appalachian back country. Nonconforming Protestants, Puritans, Separatists, Independents, English religious groups coming out of the English Civil War, and other English dissenters not satisfied with the degree to which the Church of England had been reformed, held overwhelmingly Reformed views. They are often cited among the primary founders of the United States of America. Dutch Calvinist settlers were also the first successful European colonizers of South Africa, beginning in the 17th century, who became known as Boers or Afrikaners. 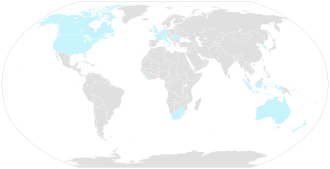 Countries with historically sizeable Reformed communities. Sierra Leone was largely colonized by Calvinist settlers from Nova Scotia, who were largely Black Loyalists, blacks who had fought for the British during the American War of Independence. John Marrant had organized a congregation there under the auspices of the Huntingdon Connection. Some of the largest Calvinist communions were started by 19th and 20th century missionaries. Especially large are those in Indonesia, Korea and Nigeria. In South Korea there are 20,000 Presbyterian congregations with about 9–10 million church members, scattered in more than 100 Presbyterian denominations. In South Korea, Presbyterianism is the largest Christian denomination. The Reformed family of churches is one of the largest Christian denominations. According to adherents.com the Reformed/Presbyterian/Congregational/United churches represent 75 million believers worldvide. Many conservative Reformed churches which are strongly Calvinistic formed the World Reformed Fellowship which has about 70 member denominations. Most are not part of the World Communion of Reformed Churches because of its ecumenial attire. The International Conference of Reformed Churches is another conservative association. Reformed theologians affirm that the Bible is true, but differences emerge among them over the meaning and extent of its truthfulness. Conservative followers of the Princeton theologians take the view that the Bible is true and inerrant, or incapable of error or falsehood, in every place. This view is very similar to that of Catholic orthodoxy as well as modern Evangelicalism. Another view, influenced by the teaching of Karl Barth and Neo-Orthodoxy, is found in the Presbyterian Church (U.S.A.)'s Confession of 1967. Those who take this view believe the Bible to be the primary source of our knowledge of God, but also that some parts of the Bible may be false, not witnesses to Christ, and not normative for today's church. In this view, Christ is the revelation of God, and the scriptures witness to this revelation rather than being the revelation itself. Dawn DeVries, a professor at Union Presbyterian Seminary, has written that Barth's doctrine of Scripture is not capable of resolving conflicts in contemporary churches, and proposed that Scripture not be thought of as the Word of God at all, but only human reports of the revealed Jesus Christ. Traditionally, Reformed theologians have also followed the medieval tradition going back to the early church councils of Nicaea and Chalcedon on the doctrine of the Trinity. God is affirmed to be one God in three persons: Father, Son, and Holy Spirit. The Son (Christ) is held to be eternally begotten by the Father and the Holy Spirit eternally proceeding from the Father and Son. However, contemporary theologians have been critical of aspects of Western views here as well. 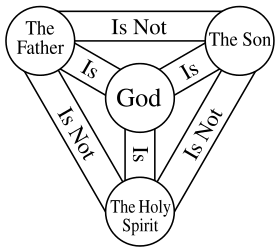 Drawing on the Eastern tradition, these Reformed theologians have proposed a "Social Trinity" where the persons of the Trinity only exist in their life together as persons-in-relationship. 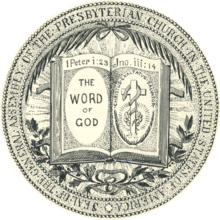 Contemporary Reformed confessions such as the Barmen Confession and Brief Statement of Faith of the Presbyterian Church (USA) have avoided language about the attributes of God and have emphasized his work of reconciliation and empowerment of people. Feminist theologian Letty Russell used the image of partnership for the persons of the Trinity. According to Russell, thinking this way encourages Christians to interact in terms of fellowship rather than reciprocity. Conservative Reformed theologian Michael Horton, however, has argued that social trinitarianism is untenable because it abandons the essential unity of God in favor of a community of separate beings in community. Christians believe Jesus' death and resurrection makes it possible for believers to attain forgiveness for sin and reconciliation with God through the atonement. Reformed Protestants generally subscribe to a particular view of the atonement called substitutionary atonement, which explains Christs death as a sacrificial payment for sin. Christ is believed to have died in place of the believer, who is accounted righteous as a result of this sacrificial payment. Contemporary Reformed theologians such as William Placher and Nancy Duff have criticized this view, claiming it makes God appear abusive or vindictive and sanctions violence by the strong against the weak. In Christian theology, people are created good and in the image of God but have become corrupted by sin, which causes them to be imperfect and overly self-interested. 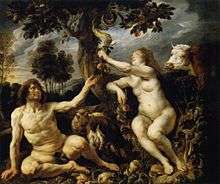 Reformed Christians, following the tradition of Augustine of Hippo, believe that this corruption of human nature was brought on by Adam and Eve's first sin, a doctrine called original sin. Reformed theologians emphasize that this sinfulness affects all of a person's nature, including their will. This view, that sin so dominates people that they are unable to avoid sin, has been called total depravity. In colloquial English, the term "total depravity" can be easily misunderstood to mean that people are absent of any goodness or unable to do any good. However the Reformed teaching is actually that while people continue to bear God's image and may do things that are outwardly good, their sinful intentions affect all of their nature and actions so that they are not wholly pleasing to God. Reformed theologians teach that sin so affects human nature that they are unable even to exercise faith in Christ by their own will. While people are said to retain will, in that they willfully sin, they are unable not to sin because of the corruption of their nature due to original sin. To remedy this, Reformed Christians believe that God predestined some people to be saved. This choice by God to save some is held to be unconditional and not based on any characteristic or action on the part of the person chosen. This view is opposed to the Arminian view that God's choice of whom to save is conditional or based on his foreknowledge of who would respond positively to God. Most objections to and attacks on Calvinism focus on the "five points of Calvinism," also called the doctrines of grace, and remembered by the mnemonic "TULIP." The five points are popularly said to summarize the Canons of Dort; however, there is no historical relationship between them, and some scholars argue that their language distorts the meaning of the Canons, Calvin's theology, and the theology of 17th-century Calvinistic orthodoxy, particularly in the language of total depravity and limited atonement. The five points were more recently popularized in the 1963 booklet The Five Points of Calvinism Defined, Defended, Documented by David N. Steele and Curtis C. Thomas. The origins of the five points and the acronym are uncertain, but they appear to be outlined in the Counter Remonstrance of 1611, a less known Reformed reply to the Arminians that occurred prior to the Canons of Dort. The acronym was used by Cleland Boyd McAfee as early as circa 1905. An early printed appearance of the T-U-L-I-P acronym is in Loraine Boettner's 1932 book, The Reformed Doctrine of Predestination. The acronym was very cautiously if ever used by Calvinist apologists and theologians before the booklet by Steele and Thomas. More recently, theologians have sought to reformulate the TULIP acronym to more accurately reflect the Canons of Dort. "Total depravity," also called "total inability," asserts that as a consequence of the fall of man into sin, every person is enslaved to sin. People are not by nature inclined to love God, but rather to serve their own interests and to reject the rule of God. Thus, all people by their own faculties are morally unable to choose to follow God and be saved because they are unwilling to do so out of the necessity of their own natures (the term "total" in this context refers to sin affecting every part of a person, not that every person is as evil as they could be). This doctrine is derived from Augustine's explanation of Original Sin. While the phrases "totally depraved" and "utterly perverse" were used by Calvin, what was meant was the inability to save oneself from sin rather than being absent of goodness. Phrases like "total depravity" cannot be found in the Canons of Dort, and the Canons as well as later Reformed orthodox theologians arguably offer a more moderate view of the nature of fallen humanity than Calvin. "Limited atonement," also called "particular redemption" or "definite atonement", asserts that Jesus's substitutionary atonement was definite and certain in its purpose and in what it accomplished. This implies that only the sins of the elect were atoned for by Jesus's death. 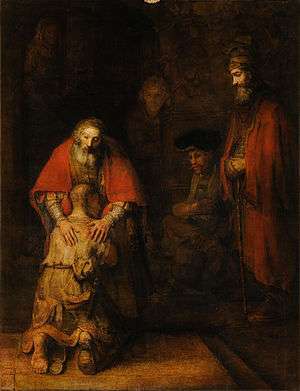 Calvinists do not believe, however, that the atonement is limited in its value or power, but rather that the atonement is limited in the sense that it is intended for some and not all. Some Calvinists have summarized this as "The atonement is sufficient for all and efficient for the elect." All Calvinists would affirm that the blood of Christ was sufficient to pay for every single human being IF it were God's intention to save every single human being. But Calvinists are also quick to point out that Jesus did not spill a drop of blood in vain (Galatians 2:21), and therefore, we can only be sure that His blood sufficed for those for whom it was intended, however many (Matthew 26:28) or few (Matthew 7:14) that may be. Some Calvinists also teach that the atonement accomplished certain benefits for all mankind, albeit, not their eternal salvation. The doctrine is driven by the Calvinistic concept of the sovereignty of God in salvation and their understanding of the nature of the atonement. At the Synod of Dort, both sides agreed that the atonement of Christ's death was sufficient to pay for all sin and that it was only efficacious for some (it only actually saved some). The controversy centered on whether this limited efficacy was based on God's election (the view of the Synod and of later Reformed theologians) or on the choice of each person and God's foreknowledge of that choice (the view of Arminius). "Irresistible grace," also called "efficacious grace", asserts that the saving grace of God is effectually applied to those whom he has determined to save (that is, the elect) and overcomes their resistance to obeying the call of the gospel, bringing them to a saving faith. This means that when God sovereignly purposes to save someone, that individual certainly will be saved. The doctrine holds that this purposeful influence of God's Holy Spirit cannot be resisted, but that the Holy Spirit, "graciously causes the elect sinner to cooperate, to believe, to repent, to come freely and willingly to Christ." This is not to deny the fact that the Spirit's outward call (through the proclamation of the Gospel) can be, and often is, rejected by sinners; rather, it's that inward call which cannot be rejected. In order to identify the visible church, Reformed theologians have spoken of certain marks of the Church. For some, the only mark is the pure preaching of the gospel of Christ. Others, including John Calvin, also including the right administration of the sacraments. 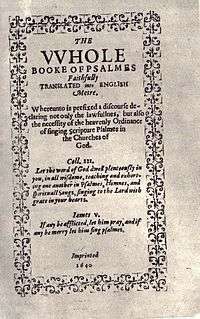 Others, such as those following the Scots Confession, include a third mark of rightly administered church discipline, or exercise of censure against unrepentant sinners. These marks allowed the Reformed to identify the church based on its conformity to the Bible rather than the Magisterium or church tradition. The 1689 London Baptist Confession of Faith does not use the term sacrament, but describes baptism and the Lord's supper as ordinances, as do most Baptists Calvinist or otherwise. Baptism is only for those who "actually profess repentance towards God," and not for the children of believers. Baptists also insist on immersion or dipping, in contradistinction to other Reformed Christians. The Baptist Confession describes the Lord's supper as "the body and blood of Christ being then not corporally or carnally, but spiritually present to the faith of believers in that ordinance," similarly to the Westminster Confession. There is significant latitude in Baptist congregations regarding the Lord's supper, and many hold the Zwinglian view. Christian Reconstructionism is a fundamentalist Calvinist theonomic movement that has remained rather obscure. Founded by R. J. Rushdoony, the movement has had an important influence on the Christian Right in the United States. The movement declined in the 1990s and was declared dead in a 2008 Church History journal article. Christian Reconstructionists are usually postmillennialists and followers of the presuppositional apologetics of Cornelius Van Til. They tend to support a decentralized political order resulting in laissez-faire capitalism. The New Calvinism is a growing perspective within conservative Evangelicalism that embraces the fundamentals of 16th century Calvinism while also trying to be relevant in the present day world. In March 2009, Time magazine described the New Calvinism as one of the "10 ideas changing the world". Some of the major figures in this area are John Piper, Mark Driscoll, Al Mohler, Mark Dever, C. J. Mahaney, Joshua Harris, and Tim Keller. New Calvinists have been criticized for blending Calvinist soteriology with popular Evangelical positions on the sacraments and continuationism. Stephen Bocskay, leader of Hungarian Calvinists in anti-Habsburg rebellion and first Calvinist prince of Transylvania. Calvin's concept of God and man contained strong elements of freedom that were gradually put into practice after his death, in particular in the fields of politics and society. 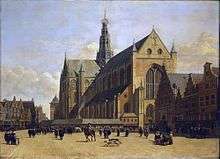 After the successful fight for independence from Spain (1579), the Netherlands, under Calvinist leadership, became the freest country in Europe. It granted asylum to persecuted religious minorities, e.g. French Huguenots, English Independents (Congregationalists), and Jews from Spain and Portugal. The ancestors of philosopher Baruch Spinoza were Portuguese Jews. Aware of the trial against Galileo, René Descartes lived in the Netherlands, out of reach of the Inquisition. Pierre Bayle, a Reformed Frenchman, also felt safer in the Netherlands than in his home country. He was the first prominent philosopher who demanded tolerance for atheists. Hugo Grotius was able to publish a rather liberal interpretation of the Bible and his ideas about natural law. Moreover, the Calvinist Dutch authorities allowed the printing of books that could not be published elsewhere, e.g. Galileo's Discorsi. Even more important than the liberal development of the Netherlands was the rise of modern democracy in England and North America. 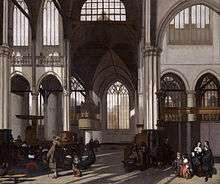 In the Middle Ages state and church had been closely connected. Martin Luther's doctrine of the two kingdoms separated state and church in principle. His doctrine of the priesthood of all believers raised the laity to the same level as the clergy. Going one step further, Calvin included elected laymen (church elders, presbyters) in his concept of church government. The Huguenots added synods whose members were also elected by the congregations. The other Reformed churches took over this system of church self-government which was essentially a representative democracy. Baptists, Quakers, and Methodists are organized in a similar way. These denominations and the Anglican Church were influenced by Calvin's theology in varying degrees. Throughout the world, the Reformed churches operate hospitals, homes for handicapped or elderly people, and educational institutions on all levels. For example, American Congregationalists founded Harvard (1636), Yale (1701), and about a dozen other colleges. Princeton was a Presbyterian foundation. Presbyterians: Calvinists in Scotland and England. Waldensians: Italian Protestants, preceded Calvinism but today identify with Reformed theology. ↑ Schaff, Philip. "Protestantism". New Schaff-Herzog Encyclopedia of Religious Knowledge. IX. pp. 297–299. ↑ Muller, Richard A. (2006). Dictionary of Latin and Greek Theological Terms: Drawn Principally from Protestant Scholastic Theology (1st ed.). Baker Book House. pp. 320–321. ISBN 978-0801020643. ↑ "Reformed Churches". Christian Cyclopedia. ↑ Muller 2004, pp. 131–132. ↑ Muller 2004, p. 135. ↑ "The Reformed Church". Hungarian Reformed Church of Australia. Retrieved 8 February 2014. ↑ "The Reformation In Germany And Scandinavia". Vlib.iue.it. Retrieved 2013-12-05. ↑ Chris Meehan (2010-10-04). "Touched by Devotion in South Korea". Christian Reformed Church. Retrieved 2013-12-05. ↑ Pew Research Center's Forum on Religion and Public Life (December 19, 2011), Global Christianity (PDF), pp. 21, 70. 1 2 "Major Branches of Religions". ↑ "WCRC History". World Communion of Reformed Churches. Archived from the original on 7 July 2011. Retrieved 7 July 2011. The World Alliance of Reformed Churches (WARC) and the Reformed Ecumenical Council (REC) have merged to form a new body representing more than 80 million Reformed Christians worldwide. 1 2 Allen 2010, p. 31. ↑ McKim 2001, p. 20. ↑ DeVries 2003, p. 295. ↑ DeVries 2003, p. 309. 1 2 Allen 2010, pp. 34–35. ↑ Allen 2010, p. 48. ↑ Horton 2011a, pp. 420–421. 1 2 Allen 2010, pp. 61–62. ↑ McKim 2001, p. 29. ↑ Stroup 1993, p. 142. ↑ Stroup 1993, p. 156–157. ↑ Stroup 1993, p. 164. ↑ McKim 2001, p. 222 n. 19. ↑ Muller, Richard A. (2012). Calvin and the Reformed Tradition (Ebook ed.). Grand Rapids, MI: Baker Academic. p. 51. ↑ McKim 2001, p. 73. 1 2 Allen 2010, pp. 77–78. 1 2 McKim 2001, p. 114. ↑ Allen 2010, p. 80. ↑ McKim 2001, p. 113. ↑ Allen 2010, p. 84. ↑ Allen 2010, p. 85. ↑ Allen 2010, pp. 100–101. ↑ McKim 2001, pp. 229–230. ↑ Guthrie 2008, pp. 47–49. ↑ Horton 2011b, p. 15. ↑ Sproul, R C (1997). What is Reformed Theology?. Grand Rapids: Baker Books. pp. 27–28. ↑ Muller, Richard A. (2012). Calvin and the Reformed Tradition (Ebook ed.). Grand Rapids, MI: Baker Academic. pp. 50–51. Stewart, Kenneth J. (2008). "The Points of Calvinism: Retrospect and Prospect" (PDF). Scottish Journal of Evangelical Theology. 26 (2): 189. ↑ Document translated in DeJong, Peter Y. (1968). Crisis In The Reformed Churches: Essays in Commemoration of the Synod of Dort (1618-1619). Grand Rapids, Michigan: Reformed Fellowship, Inc. pp. 52–58. .
↑ Boettner, Loraine. "The Reformed Doctrine of Predestination" (PDF). Bloomingtonrpchurch.org. Retrieved 2013-12-05. ↑ Stewart, Kenneth J. (2008). "The Points of Calvinism: Retrospect and Prospect" (PDF). Scottish Journal of Evangelical Theology. 26 (2): 189–193. ↑ See Daniel Montgomery and Timothy Paul Jones, PROOF: Finding Freedom Through the Intoxicating Joy of Irresistible Grace. Grand Rapids, MI: Zondervan, 2014. The authors of PROOF offer a reformulated acronym to communicate the positive achievements of Dort and the reformed doctrines of grace. PROOF stands for P: Planned Grace, R: Resurrecting Grace, O: Outrageous Grace, O: Overcoming Grace, F: Forever Grace. ↑ Elizabeth A. Livingstone (2005). "Original sin". The Oxford dictionary of the Christian Church (3rd rev. ed.). Oxford: Oxford University Press. ISBN 9780192802903. ↑ Muller, Richard A. (2012). "Was Calvin a Calvinist?". Calvin and the Reformed Tradition (Ebook ed.). Grand Rapids, MI: Baker Academic. p. 51. ISBN 978-1-4412-4254-9. ↑ "The Five Points of Calvinism, TULIP". Calvinistcorner.com. Retrieved 2013-12-05. ↑ See John Gill's commentary on 1 Timothy 4:10. ↑ Muller, Richard A. (2012). Calvin and the Reformed Tradition (Ebook ed.). Grand Rapids, MI: Baker Academic. pp. 51–52. ISBN 978-1-4412-4254-9. ↑ Loraine Boettner. "The Perseverance of the Saints". The Reformed Doctrine of Predestination. ↑ McKim 2001, p. 125. 1 2 McKim 2001, p. 126. 1 2 3 John Barber (25 June 2006). "Luther and Calvin on Music and Worship". Reformed Perspectives Magazine. 8 (26). Retrieved 2008-05-06. ↑ Brian Schwertley (1998). "Musical Instruments in the Public Worship of God". Retrieved 2007-11-16. ↑ Maxwell, William D. (1936). An Outline of Christian Worship: Its Development and Forms. London: Oxford University Press. ↑ John Frame (1996). Worship in Spirit and Truth. Phillipsburg, NJ: P&R Pub. ISBN 0-87552-242-4. 1 2 WCF 1646, XXVII.II. ↑ 1689 Baptist Confession of Faith. Wikisource. Ch. 28 Sec. 2. ↑ 1689 Baptist Confession of Faith. Wikisource. Ch. 28 Sec. 4. ↑ Hodge, Charles (1871). "Systematic Theology – Volume II – Supralapsarianism". Christian Classics Ethereal Library. Retrieved 2007-06-04. ↑ Hodge, Charles (1871). "Systematic Theology – Volume II – Infralapsarianism". Christian Classics Ethereal Library. Retrieved 2007-06-04. ↑ "Systematic Theology – Volume II – Christian Classics Ethereal Library". Ccel.org. 2005-07-21. Retrieved 2013-12-05. ↑ Benjamin B. Warfield, Works vol. V,Calvin and Calvinism, pp. 364–365, and vol. VI, The Westminster Assembly and Its Work, pp. 138–144. ↑ Michael Horton in J. Matthew Pinson (ed. ), Four Views on Eternal Security, 113. ↑ Westminster Larger Catechism. Wikisource. Question 68. ↑ James E. McGoldrick, Abraham Kuyper: God's Renaissance Man. (Welwyn, UK: Evangelical Press, 2000). ↑ Duncan, J. Ligon, III (15 October 1994). Moses' Law for Modern Government. Annual national meeting of the Social Science History Association. Atlanta. Archived from the original on 30 November 2012. Retrieved 23 August 2013. ↑ Ingersoll, Julie (2013). "Religiously Motivated Violence in the Abortion Debate". In Juergensmeyer, Mark; Kitts, Margo; Jerryson, Michael. Oxford Handbook of Religion and Violence. New York: Oxford University Press. pp. 316–317. doi:10.1093/oxfordhb/9780199759996.013.0020. ↑ Clarkson, Frederick (1995). "Christian Reconstructionism". In Berlet, Chip. Eyes Right! : Challenging the Right Wing Backlash. Boston: South End Press. p. 73. ISBN 9780896085237. ↑ Ingersoll, Julie (2009). "Mobilizing Evangelicals: Christian Reconstructionism and the Roots of the Religious Right". In Brint, Steven; Schroedel, Jean Reith. Evangelicals and Democracy in America: Religion and politics. 2. New York: Russell Sage Foundation. p. 180. ISBN 9780871540683. ↑ North & DeMar 1991, pp. 81. 1 2 Collin (2006-09-22). "Young, Restless, Reformed". Christianity Today. Retrieved 2009-03-13. 1 2 David van Biema (2009). "10 Ideas Changing the World Right Now: The New Calvinism". Time. Retrieved 2009-03-13. ↑ Burek, Josh (27 March 2010). "Christian faith: Calvinism is back". The Christian Science Monitor. Retrieved 16 March 2011. ↑ Chew, David (June 2010). "Tim Keller and the New Calvinist idea of "Gospel eco-systems"". Christian Research Network. Archived from the original on 11 October 2011. ↑ Clark, R. Scott (15 March 2009). "Calvinism Old and "New"". Archived from the original on 1 July 2015. ↑ "Plymouth Colony Legal Structure". Histarch.uiuc.edu. 2007-12-14. Retrieved 2013-12-05. ↑ Hans Fantel (1974), William Penn: Apostle of Dissent, William Morrow and Co., New York, N.Y.
↑ Swart, Ignatius (2012). Welfare, Religion and Gender in Post-apartheid South Africa: Constructing a South-North Dialogue. AFRICAN SUN MeDIA. p. 326. Retrieved 2016-10-18.